Gallaudet University[a] /ˌɡæləˈdɛt/ is a federally chartered private university for the education of the deaf and hard of hearing. It is located in Washington, D.C. on a 99-acre (0.40 km2) campus. Founded in 1864, Gallaudet University was originally a grammar school for both deaf and blind children. It was the first school for the advanced education of the deaf and hard of hearing in the world and remains the only higher education institution in which all programs and services are specifically designed to accommodate deaf and hard of hearing students. Hearing students are admitted to the graduate school and a small number are also admitted as undergraduates each year. The university was named after Thomas Hopkins Gallaudet, a notable figure in the advancement of deaf education. Gallaudet University is officially bilingual, with American Sign Language (ASL) and written English used for instruction and by the college community. Although there are no specific ASL proficiency requirements for undergraduate admission, many graduate programs require varying degrees of knowledge of the language as a prerequisite. College-level courses were offered for the first time during the 1864-65 academic year. Congress provided approval for Columbia to grant college degrees, and an enabling act for the college was passed and approved by President Lincoln. An elaborate inauguration ceremony was held in June with Laurent Clerc in attendance. Fourteen acres of land was purchased with money supplied by the government. Gallaudet was promoted to the position of president of the institution. He continued to push for funds for expansion and new buildings. Gallaudet also proposed discontinuing services for blind students, saying that the small number of blind students would be better served at the school for the blind in Baltimore. On October 18, 2009, the Board of Trustees announced that Gallaudet's tenth president would be T. Alan Hurwitz. He began his tenure on January 1, 2010, and served until he retired on December 31, 2015, succeeded by Roberta Cordano, the eleventh president. There have been 15 occasions in Gallaudet history when a US president has visited either the campus or attended an official function off campus. President Johnson's second visit, in 1966, was unannounced and impromptu. President Kennedy had planned to attend the centennial celebration at Gallaudet in 1964, but was assassinated. President Benjamin Harrison, 1889 (Two visits, May and June). Classes are conducted in ASL with no spoken English, and curriculum materials are designed in both ASL and English. The classrooms are visually-oriented, and are organized around the philosophy of Deaf space, such as all the desks arranged in a circle so that all students and teachers can see one another for discussions. If a professor needs to get the attention of the classroom, they will flash a lights signal. 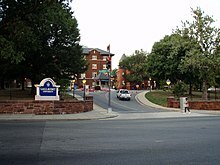 Gallaudet College Historic District was added to the National Register of Historic Places in 1974. District of Columbia Inventory of Historic Sites (listings added in 1964 and 1973). 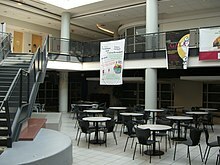 The campus is shared with Kendall Demonstration Elementary School, a day school serving deaf and hard of hearing students from birth through grade 8, and the Model Secondary School for the Deaf, a day and residential high school for deaf and hard of hearing students. In October 2014, the Gallaudet University board of trustees announced a 10-year, $450 million development of its campus along 6th Street NE. The development, which includes both campus property as well as college-owned residential and retail property across the street, will be overseen by JBG Smith. The football and soccer teams play at Hotchkiss Field with the track and field teams using Berg Track located within Hotchkiss Field for track meets. Basketball and volleyball use the GU Field House for home games. Hoy Field is home to the baseball team and the GU Softball Complex hosts the softball team. Dawn Birley, certified as Olympic-eligible, won several national Canadian Taekwondo championships; she didn't make it to the Olympics only because taekwondo was not considered as a medal sport in the 1996 Summer Olympics. Tony Tatum, All-American Cornerback from 2009-2012, became the first football player in Gallaudet University to play professionally. Signed to AFL's Utah Blaze and posted 3 interceptions, one returned for a touchdown. Currently signed to the Cleveland Gladiators. The campus Greek community is relatively small with only 4 fraternities and 4 sororities. The four fraternities are Kappa Gamma, Alpha Sigma Pi, Kappa Sigma, and Delta Sigma Phi. The four sororities are Delta Epsilon, Phi Kappa Zeta, Alpha Sigma Theta, and Delta Zeta. The Gallaudet Office of Research Support and International Affairs (RSIA) (formerly Gallaudet Research Institute or GRI) is internationally recognized for its leadership in deafness-related research. RSIA researchers gather and analyze data concerning the social, academic, and perceptual characteristics of deaf and hard of hearing populations, primarily to provide information needed by educators in the field. Staff are skilled in various research methodologies including surveys, test norming and assessment, ethnographic studies, clinical studies, and information management. In 2016, RSIA began hosting the Gallaudet Research Expo, to give students, faculty, and staff "the opportunity to share ideas and showcase scholarly pursuits and achievements." Presentations represent "education, linguistics, STM, neuroscience, interpretation and translation, computer science, audiology, psychology, deaf studies, and other fields that reflect Gallaudet's research priorities." The third Gallaudet RExpo will be held in October 2018. Gallaudet University Press publishes two academic journals, American Annals of the Deaf (est. 1847) and Sign Language Studies (est. 1972). The Annals are "the oldest and most widely read English-language journal dealing with deafness and the education of deaf persons." The Department of Psychology's chapter of Psi Chi publishes the journal Gallaudet Chronicles of Psychology. The journal is managed and edited by graduate student members of the chapter. The Chronicles are designed to "mimic professional, peer-reviewed journals" and provides graduate students with an opportunity disseminate their original psychology research. In 2018, the chapter will be publishing the fifth volume of the Chronicles. In the fall of 2010, the university's Department of Deaf Studies launched the Deaf Studies Digital Journal (DSDJ), the first peer-reviewed academic and creative arts journal in American Sign Language and English. The DSDJ itself is published in entirely video-based content and is available online. To date, only four issues of DSDJ have been released, the most recent being published in 2014. ^ "Columbia Institution for the Deaf" was the corporate name for what is now Gallaudet University. In 1954 a law was passed, changing the corporate name to "Gallaudet College." (The collegiate department of the Columbia Institution had gone by the name "Gallaudet College" since 1894.) In 1986, another law was passed changing the name to "Gallaudet University." ^ "Title 20: Education" (PDF). US Government Printing Office. pp. 1097–1098. Archived (PDF) from the original on June 10, 2015. ^ Staff (2013). "Gallaudet University". U.S. News and World Report. Archived from the original on April 30, 2013. Retrieved February 18, 2013. ^ "History of Gallaudet University". Gallaudet University. Archived from the original on April 30, 2013. Retrieved July 18, 2012. ^ "John Carlin". Deafbiography.com. Archived from the original on March 16, 2012. Retrieved February 10, 2012. ^ "A Century of Lawmaking for a New Nation: U.S. Congressional Documents and Debates, 1774–1875". The Library of Congress. Archived from the original on April 30, 2013. Retrieved July 18, 2012. ^ "38th Congress: Session 1, Chapter 52" (PDF). Save Our Deaf Schools. Archived (PDF) from the original on April 30, 2013. Retrieved July 16, 2012. ^ "Gallaudet College Hearing Before the Committee on Education and Labor" (PDF). 83rd Congress, Second Session. Save Our Deaf Schools. May 5, 1954. Archived (PDF) from the original on April 30, 2013. Retrieved July 16, 2012. ^ "Gallaudet Dean George Detmold, 88". August 16, 2005. Archived from the original on January 11, 2017 – via www.washingtonpost.com. ^ a b 20 U.S.C. ch. 55, "EDUCATION OF THE DEAF"
^ "First Annual Report" (PDF). Save Our Deaf Schools. November 1, 1858. Archived (PDF) from the original on April 30, 2013. Retrieved July 18, 2012. ^ "Second Annual Report" (PDF). Save Our Deaf Schools. November 5, 1859. Archived (PDF) from the original on April 30, 2013. Retrieved July 18, 2012. ^ "Third Annual Report" (PDF). Save Our Deaf Schools. November 5, 1860. Archived (PDF) from the original on April 30, 2013. Retrieved July 18, 2012. ^ "Fourth Annual Report" (PDF). Save Our Deaf Schools. November 5, 1861. Archived (PDF) from the original on April 30, 2013. Retrieved July 18, 2012. ^ "Fifth Annual Report" (PDF). Save Our Deaf Schools. November 3, 1862. Archived (PDF) from the original on April 30, 2013. Retrieved July 18, 2012. ^ "Fifth Annual Report" (PDF). Save Our Deaf Schools. October 15, 1863. Archived (PDF) from the original on April 30, 2013. Retrieved July 18, 2012. ^ "Seventh Annual Report" (PDF). Save Our Deaf Schools. November 17, 1864. Archived (PDF) from the original on April 30, 2013. Retrieved July 18, 2012. ^ "Eight Annual Report" (PDF). Save Our Deaf Schools. November 6, 1865. Archived (PDF) from the original on April 30, 2013. Retrieved July 18, 2012. ^ "Ninth Annual Report" (PDF). Save Our Deaf Schools. November 6, 1866. Archived (PDF) from the original on April 30, 2013. Retrieved July 18, 2012. ^ "Tenth Annual Report" (PDF). Save Our Deaf Schools. October 28, 1867. Archived (PDF) from the original on April 30, 2013. Retrieved July 18, 2012. ^ "Eleventh Annual Report" (PDF). Save Our Deaf Schools. October 26, 1868. Archived (PDF) from the original on April 30, 2013. Retrieved July 18, 2012. ^ "Twelfth Annual Report" (PDF). Save Our Deaf Schools. October 20, 1869. Archived (PDF) from the original on April 30, 2013. Retrieved July 18, 2012. ^ "Twelfth Annual Report" (PDF). Save Our Deaf Schools. October 29, 1870. Archived (PDF) from the original on April 30, 2013. Retrieved July 18, 2012. ^ a b Jordan, I. King (January 22, 2007). "Deaf Culture and Gallaudet". The Washington Post. Archived from the original on November 4, 2012. Retrieved May 3, 2010. ^ "Speech by Congresswoman Eleanor Holmes Norton at the Installation of Gallaudet President Robert R. Davila" (PDF). Save Our Deaf Schools. May 9, 2007. Archived (PDF) from the original on February 9, 2012. Retrieved July 16, 2012. ^ "News". news.gallaudet.edu. Archived from the original on June 22, 2010. ^ On Probation Archived March 22, 2018, at the Wayback Machine, Washington Post, July 14, 2007. ^ "MSCHE Accreditation – Gallaudet University". Aaweb.gallaudet.edu. June 26, 2008. Archived from the original on June 9, 2010. Retrieved February 10, 2012. ^ "Janice Becker, Plaintiff vs. Gallaudet University, Defendant" (PDF). Save Our Deaf Schools. Archived (PDF) from the original on April 30, 2013. Retrieved July 16, 2012. ^ "Profiles of Existing Government Corporations" (PDF). U.S. Government Accountability Office. Archived (PDF) from the original on April 30, 2013. Retrieved July 16, 2012. ^ Major, Owens, (October 16, 1992). "H.R.5483 - 102nd Congress (1991-1992): Education of the Deaf Act Amendments of 1992". thomas.loc.gov. Archived from the original on July 5, 2016. ^ "Columbia Institution for the Deaf Annual Report, Gallaudet University Archives, 1870" (PDF). Archived (PDF) from the original on February 27, 2008. ^ "A Growing College" (PDF). Gallaudet Protest. Archived from the original (PDF) on April 30, 2013. Retrieved July 16, 2012. ^ "Speeches & Messages of Rutherford B. Hayes". Rutherford B. Hayes Presidential Library & Museums. Archived from the original on September 28, 2015. ^ "Columbia Institution for the Deaf Annual Report, Gallaudet University Archives, 1877" (PDF). Archived (PDF) from the original on February 27, 2008. ^ History of the College for the Deaf, 1857–1907 – Edward Miner Gallaudet, Lance J. Fischer, David L. De Lorenzo – Google Boeken. Books.google.com. Retrieved February 10, 2012. ^ "Columbia Institution for the Deaf Annual Report, Gallaudet University Archives, 1879" (PDF). Archived (PDF) from the original on February 27, 2008. ^ "Columbia Institution for the Deaf and Dumb: 23rd Annual Report" (PDF). Save Our Deaf Schools. Archived (PDF) from the original on April 30, 2013. Retrieved July 16, 2012. ^ "Columbia Institution for the Deaf Annual Report, Gallaudet University Archives, 1881" (PDF). Archived (PDF) from the original on February 27, 2008. ^ Gallaudet, Edward M. "A History of the Columbia Institution For The Deaf and Dumb" (PDF). Save Our Deaf Schools. Archived (PDF) from the original on April 30, 2013. Retrieved July 16, 2012. ^ "Address of Emeritus President E.M. Gallaudet" (PDF). Save Our Deaf Schools. May 6, 1914. Archived (PDF) from the original on April 30, 2013. Retrieved July 16, 2012. ^ "Columbia Institution for the Deaf Annual Report, Gallaudet University Archives, 1882" (PDF). Archived (PDF) from the original on February 27, 2008. ^ "Columbia Institution for the Deaf Annual Report, Gallaudet University Archives, 1885" (PDF). Archived (PDF) from the original on March 27, 2015. ^ Roosevelt, Theodore (March 23, 2018). "Presidential addresses and state papers". New York : The Review of Reviews Company – via Internet Archive. ^ "Our heritage : Gallaudet College centennial (Book, 1964)". [WorldCat.org]. Archived from the original on April 30, 2013. Retrieved July 16, 2012. ^ "Lyndon B. Johnson: Remarks at the Gallaudet College Centennial Banquet". Presidency.ucsb.edu. June 6, 1964. Archived from the original on April 30, 2013. Retrieved July 16, 2012. ^ University, Gallaudet. "- Gallaudet University". videocatalog.gallaudet.edu. Archived from the original on September 27, 2015. ^ University, Gallaudet. "Deaf film 166-4: President Lyndon B. Johnson as guest speaker at Gallaudet Commencement, June 13, 1966 - Gallaudet University". videocatalog.gallaudet.edu. Archived from the original on September 27, 2015. ^ "Remarks at the Gallaudet University Commencement Ceremony". Weekly Compilation of Presidential Documents. 1994. Archived from the original on July 11, 2012. ^ a b c "Gallaudet University". US News & World Report. Archived from the original on April 30, 2013. Retrieved November 9, 2014. ^ Bauman, H-Dirksen L; Murray, Joseph M. (January 2009). "Reframing: From Hearing Loss to Deaf Gain" (PDF). Deaf Studies Digital Journal – via DSDJ. ^ Gormally, Cara L.; Marchut, Amber (January 2017). ""Science is not my thing": Exploring Deaf Non-Science Majors' Science Identities" (PDF). International Journal of Science Education. 20 (1) – via Educational Resources Information Center. ^ "FAQ: Gallaudet Bison: This guide offers background on Gallaudet University's Bison mascot". Gallaudet University. August 2006. ^ "National Register of Historical Places, District of Columbia : Galluadet University". National Park Service. Archived from the original on May 15, 2017. ^ "National Register of Historical Places - Inventory Nomination Form" (PDF). National Park Service. Archived (PDF) from the original on January 7, 2017. ^ "D.C. Inventory of Historic Sites" (PDF). District of Columbia. October 31, 2014. Archived (PDF) from the original on February 7, 2017. ^ "Gallaudet College Historic District". District of Columbia. Archived from the original on August 3, 2017. ^ "NATIONAL HISTORIC LANDMARKS SURVEY" (PDF). National Park Service. Archived (PDF) from the original on August 1, 2017. ^ "HISTORIC AMERICAN BUILDINGS SURVEY INDEX TO PHOTOGRAPHS" (PDF). Library of Congress. October 1970. Archived (PDF) from the original on February 24, 2017. ^ Center, Laurent Clerc National Deaf Education. "About Kendall Demonstration Elementary School - KDES". www3.gallaudet.edu. Archived from the original on August 3, 2017. ^ "Model Secondary School for the Deaf". www3.gallaudet.edu. Archived from the original on July 31, 2017. ^ "GALLAUDET SELECTS THE JBG COMPANIES FOR 6TH STREET NE DEVELOPMENT" (Press release). Gallaudet University. October 11, 2014. Archived from the original on August 3, 2017. ^ Clabaugh, Jeff (October 10, 2014). "Gallaudet Selects JBG for Campus Development". American City Business Journals. Archived from the original on August 3, 2017. ^ a b "Gallaudet Bison Athletics : Gallaudet University Joins North Eastern Athletic Conference". Gallaudetathletics.com. June 15, 2009. Archived from the original on April 30, 2013. Retrieved July 16, 2012. ^ "Facilities". Gallaudetathletics.com. Retrieved March 16, 2019. ^ "Beware the Thundering Herd". D3hoops.com. D3hoops.com. Archived from the original on April 2, 2015. Retrieved March 23, 2015. ^ "Embracing the silence". NCAA.org. NCAA.org. Archived from the original on March 12, 2015. Retrieved March 23, 2015. ^ a b Donvan, John (February 3, 2011). "Gallaudet University Making Noise in Women's Basketball". ABC News. Archived from the original on April 30, 2013. Retrieved May 14, 2013. ^ "Parade magazine feature on Gallaudet University's women's basketball season". D3hoops.com. USA Today. Archived from the original on April 2, 2012. Retrieved May 14, 2013. ^ Lum, Lydia. "Gallaudet Women on the Road to Winner's Circle". Diverse Issues in Higher Education. Cox, Matthews and Assoc. Archived from the original on October 26, 2013. Retrieved May 14, 2013. ^ "The History of Gallaudet University (page 3)". Pr.gallaudet.edu. November 7, 1997. Archived from the original on April 15, 2012. Retrieved July 16, 2012. ^ Foster, Brooke (August 19, 2007). "Sound and the Fury". The Washington Post. Archived from the original on November 8, 2012. Retrieved May 3, 2010. ^ "Goldstein Named Gallaudet's 36th Head Football Coach, Davis Elevated to Assistant Coach". Gallaudet University. Archived from the original on March 2, 2012. Retrieved July 16, 2012. ^ "Gallaudet Defeats Catholic for the First Time in the School History". Gallaudet University Athletics. Archived from the original on September 20, 2012. Retrieved September 7, 2012. ^ Press, The Associated. "Gallaudet football prepares for first ever playoff game". Archived from the original on December 16, 2013. ^ "Women's Volleyball". Gallaudet University. Archived from the original on September 7, 2012. Retrieved July 16, 2012. ^ "Office of Research Support and International Affairs (RSIA)". Gallaudet University. Archived from the original on September 1, 2017. Retrieved April 10, 2018. ^ a b "Gallaudet University Research Expo". Research Support and International Affairs. Gallaudet University. Archived from the original on April 10, 2018. Retrieved April 10, 2018. ^ "American Annals of the Deaf". gupress.gallaudet.edu. Archived from the original on December 1, 2012. ^ "Chronicles of Psychology". www.gallaudet.edu. ^ a b "Chronicles of Psychology". Department of Psychology Research, Psi Chi Chapter. Gallaudet University. Archived from the original on April 10, 2018. Retrieved April 10, 2018. ^ Journal, Deaf Studies Digital. "Deaf Studies Digital Journal ::". dsdj.gallaudet.edu. ^ "Edward Allen Fay - Gallaudet University". March 4, 2016. ^ "Amos Draper - Gallaudet University". September 28, 2015. ^ "Irving S. Fusfeld - Gallaudet University". March 4, 2016. ^ "William C. Stokoe, Jr: Founder of Sign Language Linguistics: 1919-2000". Gallaudet University Press. Archived from the original on October 22, 2017. Retrieved April 10, 2018. ^ DiGuglielmo, Joey (January 9, 2013). "Betty Miller, 78". Washington Blade. Archived from the original on August 24, 2017. Retrieved April 10, 2018. 1864 establishments in Washington, D.C.